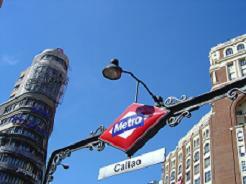 Welcome to all you need to know about the Safe, Modern and Comfortable Madrid metro system. Madrid is not only the third largest capital in the EU (after London and Berlin) but it also has the third largest underground train network in europe, and the sixth largest underground system in the world. Twelve dedicated lines criss cross the city covering any destination in Madrid you could think of. With economic prices this is the cheapest way to move around Madrid. Every year a number of new stations and extensions to various lines will mean a faster and simpler cross city journeys. Opening times are from 0600 until 0200 daily. Attached below is the link to the official Metro Madrid map (its a pdf and requires acrobat reader). If for any reason this is not available the official Metro Madrid webpage is here. Although it is all in Spanish there is an English option at the top of the screen. And on the right hand side of the screen titled "Plano" is the map. Please check back regularly as new stations and routes will be opening in the every few months. Each has its own restrictions and varying prices. Valid for travel between any two stations on the Metro, MetroSur & TFM system providing you do not leave the system. Valid for travel between any two stations on the Metro system. Does not include stations in zones B, MetroSur & TFM system. Valid for travel between two stations on line 9 in the B Zone. Not valid on Metro, MetroSur & TFM system. Residents Tip: You can buy a ticket valid for 10 journeys on the "MetroBus" (same as Metro ticket above) but only from Metro stations, cost €7.40. It is then perfectly legal to pass the ticket around between 2 or more people using the same train! Travel to and from the airport stations now incurs a supplement of 1€ which is payable either at the station upon arrival from downtown Madrid or as part of your ticket from the airport. This supplement has to be paid seperately.